Function: Invigorates the Blood, Moves Qi, Dispels Blood Stasis, Unblocks the Channels and Collaterals. This product is used for Qi and blood stagnation in the channels resulting in fixed aches and pain throughout the body which are worse with pressure and worse at night. Our East Earth Trade Winds herbalist says the literature indicates that it is useful for joint pain such as in the shoulder, arm, low back, leg, foot or hand. It may be helpful for arthritis and arthritis-like pain, carpal tunnel, and repetitive motion injury, and fibromyalgia aomng other problems. It can also be used for chronic headaches, irregular menstruation, menstrual pain. 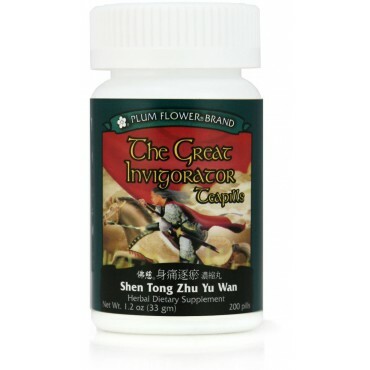 Ingredients: Prunus persica seed (Tao ren), Carthamus tinctorius flower (Hong hua), Angelica sinensis root (Dang gui), Cyathula officinalis root (Chuan niu xi), Ligusticum chuanxiong rhizome (Chuan xiong), Commiphora myrrha resin (Mo yao), Boswellia carterii resin (Ru xiang), Pheretima aspergillum (Di long), Glycyrrhiza uralensis root (Gan cao), Gentiana macrophylla root (Qin jiao), Notopterygium incisium root & rhizome (Qiang huo), Cyperus rotundus rhizome (Xiang fu). Dosage: 8 pills, 3 times per day. Contraindications: Contraindicated during pregnancy. Use with caution in Spleen deficient patients with a tendency to loose stools, diarrhea, poor appetite or chronic digestive weakness. Use with caution during heavy menstrual bleeding. Use with caution in patients on anti-coagulant therapy. Contraindicated with hemorrhagic disorders.